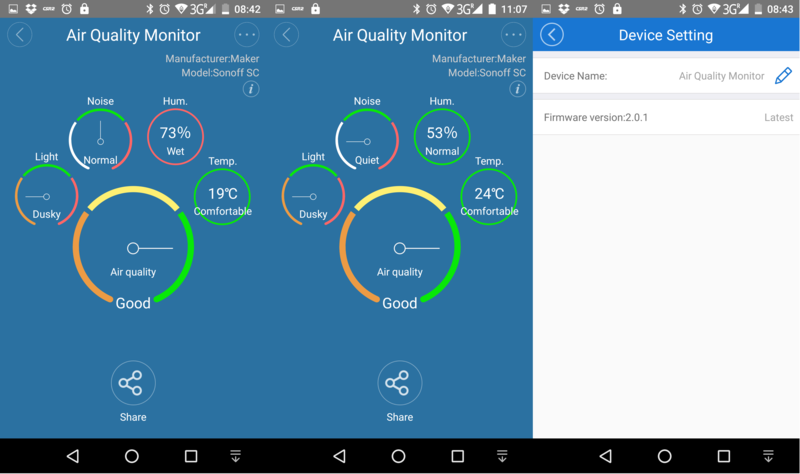 Yesterday I received two environmental monitors with Sonoff SC and vThings CO2 Monitor, and while I’ve plugged both, I have not had time to look into vThings documentation, but since I’m already using eWelink app for Sonoff TH16 wireless switch, setting up Sonoff SC just took me a few minutes, so I’ll report my experience with the device in this review. I powered Sonoff SC using the USB port of my modem router, and the green LED on the back of the device started to blink every 2 or 3 seconds. 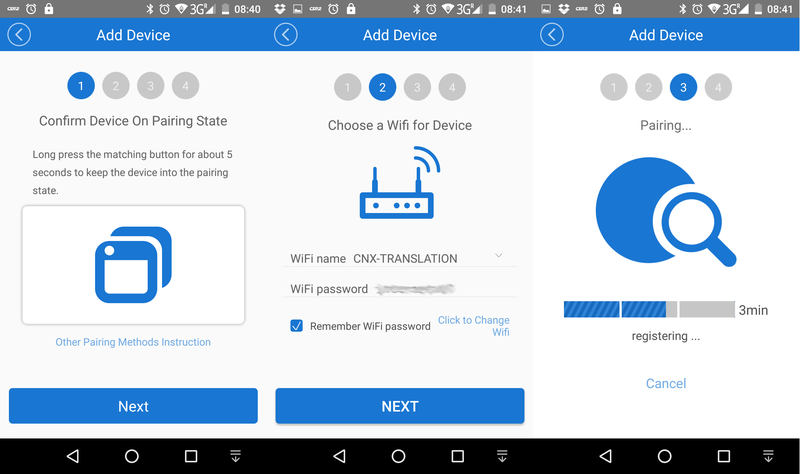 Then I started eWelink app in my Android phone and taped on the “+” icon to add a new device following the instructions here which are basically the same for all Sonoff devices. 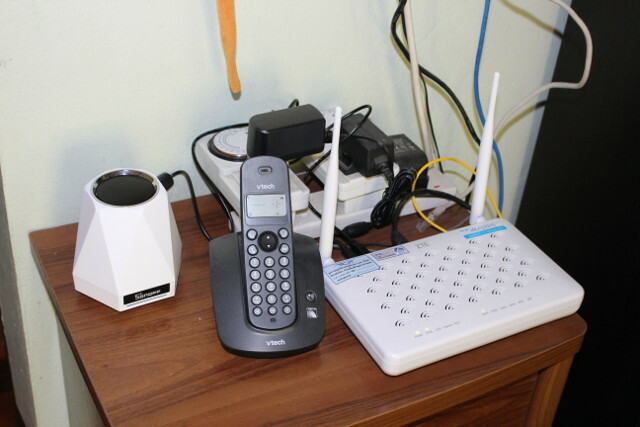 Then you need to press the “Audio” button for about 5 seconds until the green LED blinks faster, at which point you can click Next, configure connection with your WiFi router, and complete registration by giving it a name, such as “Air Quality Monitor”. Now Sonoff SC will show with your other Sonoff devices in eWelink app and show the air quality level, temperature, humidity and noise level. You can click on the > button to get to the prettier representation of the data as shown on the right screenshot above. The data was matching reality as the temperature was about 20 C at the time, and since it was still early morning, humidity was high. I started to talk a bit loud, and Noise level changed from quiet to Normal. However when I turn on a headlight in to the top of the device, the light intensity was still at dusky… I took at screenshot a little later in the morning and the temperature had risen to 24°C, while humidity lowered to 53% normal, matching reality although probably not perfectly accurate due to the sensors used (e.g. DHT11). Beside reporting data to the app, Sonoff SC can also be used as a smart hub to control other Sonoff devices. 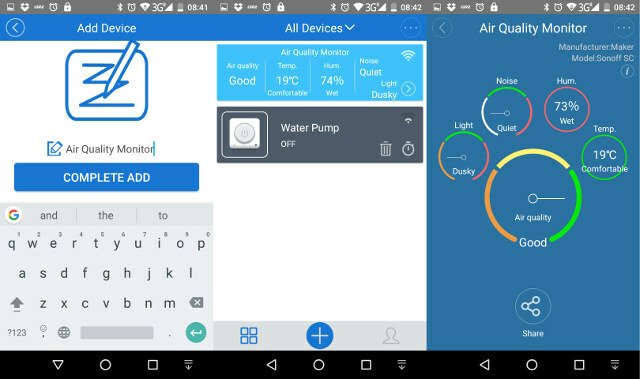 You can create “Scenes” by tapping on “…” icon in “All Devices” window, and add a condition (trigger device) using sensors from Sonoff SC or other Sonoff devices shown as “Air Quality Monitor” and “Water Pump” in the screenshot below. 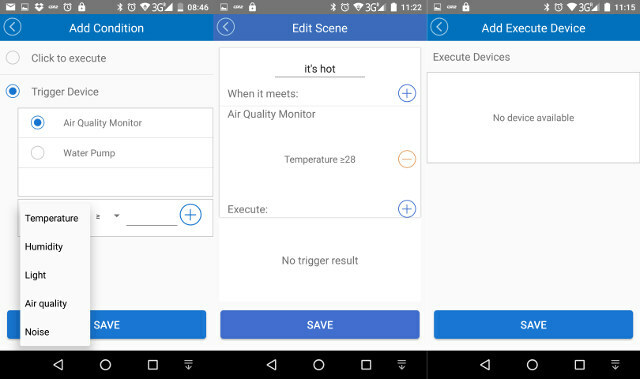 However, while I could setup a trigger device (Sonoff SC) using the temperature data, I was not able to add an “Execute Device” despite having a Sonoff TH16 wireless switch registered with eWelink app and set in manual mode (e.g. not using external sensors to trigger it on or off). I have a temperature and humidity sensor attached to Sonoff TH16, so maybe that’s why.. It might be only categorized as a “trigger device” and not an “execute device” despite also coming with a relay. I’ve contacted the company to see if there’s a solution. Sonoff SC is sold for $19.99 + shipping directly on ITEAD Studio. Now wish these (and all Sonoff) devices each had an integrated MQTT client inside the default firmware to support a standard method of local control. And as mentioned, Sonoff SC would be much better with DHT22. Why? Since you get values that are off anyway with higher ‘precision’? I did some tests with 2 DHT11 and 2 DHT22 a while ago and thought I did something wrong (since 1 DHT22 was pretty off). But it seems it’s like that, see https://forum.wemos.cc/topic/143/dht11-dht22-dht21-bmp180-showdown or http://playground.boxtec.ch/doku.php/sensors/temp-hum_sensors_compared (or any other link when googling for ‘DHT11 vs DHT22’). Did you get info from itead on how to control the sonoff-th relay with the data from the sonoff-sc (trigger)??? Nope, they just told me it should work. I think Sonoff TH has an attached sensor (and it would be a pain to remove where I placed it), so it’s defined as a trigger device, and can be be used as an “execute” device. I’ve also noticed Sonoff-SC will often hang, but it’s not obvious, as eWelink will get data from the device, but it’s just the values are stuck in time. For example, you may have 23C and 52% humidity all the time when it’s obviously quite higher or lower than that… In that case, the only solution is to power cycle Sonoff-SC and the values will be updated. Next PostNext Something is “Eating” my Android TV Box Internal Storage!